Jacob's Crackers: " The New Age of Irish Chefs " , ( Part 2) Ian Ussher @ BijouBistro .
" The New Age of Irish Chefs " , ( Part 2) Ian Ussher @ BijouBistro . Here is a young Chef to keep an eye on , Ian Ussher , Executive Head Chef @BijouBistro . Fresh from The Greenhouse and Bang Restaurants . This young man with a well developed sense of identity and firm commitment to Artisan Suppliers, is full of the promise of something refreshingly Unique to come . Through his hands , ingredients either from the fields , land or sea , he ensures their essence shines through finally on your plate in all glory . We immediately felt at ease and settled into a relaxed dining experience . Now brace yourself , for here are a few dishes we had. 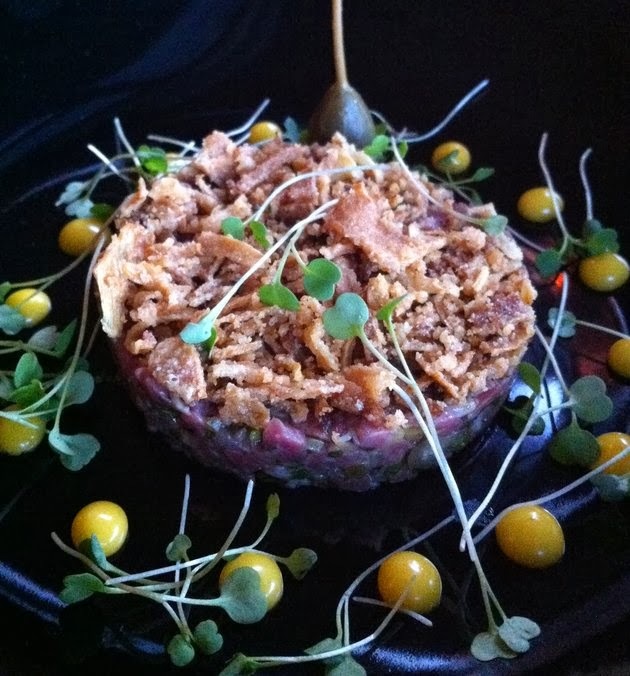 We started with a first Course of Dry aged Beef fillet Tartar , Crispy Onions & Confit egg yolks . Now there isn't a lot one can do with such a Classic dish whether it is Meat or Fish , as A Tartar relies on the quality and freshness of the core ingredient, But Seasoning is " De Rigeur " and can elevate this dish to the sublime . And this Tartar came up trumps . It was fresh , perfectly seasoned and full of flavour . The Crispy onions and Cress brought a welcoming nutty flavour and texture . Rest assured that every morsel on that plate was scooped up with the velvety Confit egg yolks . A truly amazing dish when it is so well executed . 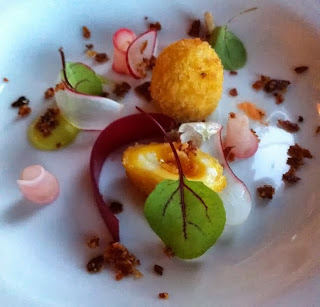 Our next Course was Quails eggs , Tarragon Aioli, Pickled Radish , Baby leaves & Crisp pancetta. I have had many Quail's eggs dishes before but none as pretty as this one . Two little spheres coated in crisp golden crumbs sat among an artistic display of pickled radish discs and shavings. The runny yolks, the saltiness of the pancetta , the peppery bite of the radishes together with the tarragon aioli was a divine combination of flavours that captured the essence of the season on a plate . These two amazing starters set the tone for the meal ahead and I was already salivating about our next course which was Crisp belly of pork , Rolled lion of pork , Basil crust , Wild garlic chives & Madeira jus . 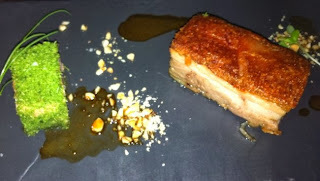 The pork belly was packed with flavour , the crispy caramelised skin had a fantastic bite and the meat just fell apart, it had almost a floral quality about it , one could almost see the pigs scoffing on a diet of juicy apples , The Rolled lion offered a pleasant contrast with textures and flavours altogether more sophisticated. The basil crust was a perfect accoutrement to the delicate flesh . This was followed by a beautifully presented dish of Glazed Cod , Crispy skin , Scallops , Petit pois , Broad beans & Borage flowers . I have always found Cod a bit on the bland side but this glazed nugget of gold brought Cod back in my estimation after just one mouthful. It melted like butter on the first bite and was a celebration of the Sea . Sweet and saline all at the same time with a delicious smack of freshness from the petit pois , broad beans and baby cress. 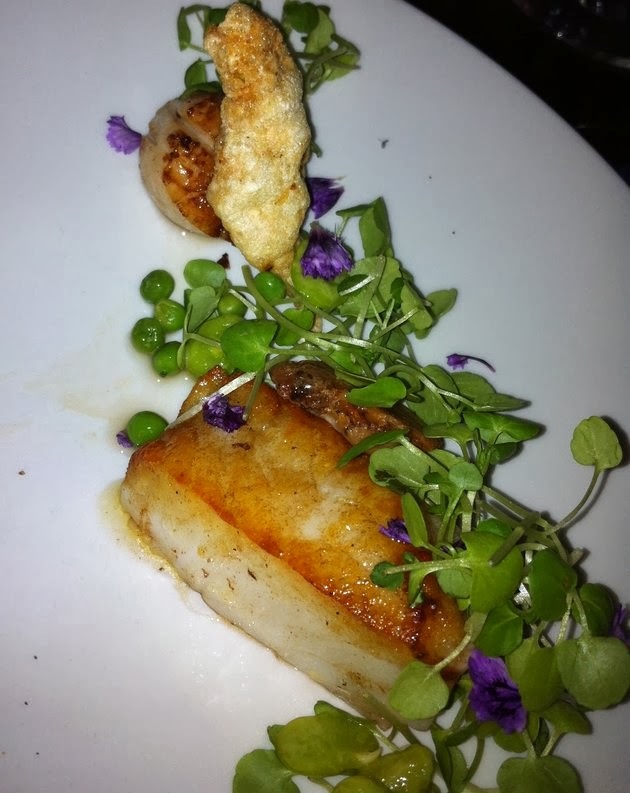 The accompanying Scallops was perfectly cooked , it was sweet and juicy. The crispy cod skin added an extra texture and pleasing saltiness to the dish. I could have written the whole review about this dish alone as it was one of the most balanced dish I have ever tasted . Well done Chef , Outstanding !!! 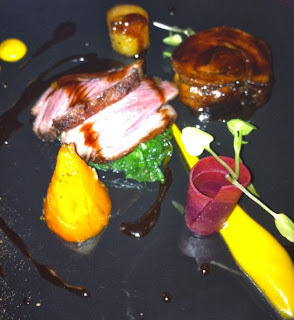 Next was Shoulder and Rump of lamb , Wilted Spinach & Heirloom Carrots . This encapsulated a rolled shoulder of lamb , two beautifully pink slices of slow roasted rump atop a mound of buttery wilted spinach , while the smoothest golden carrot puree and pickled heirloom carrots shavings completed the picture . The crispy exterior of the rolled shoulder gave way to some seriously succulent lamb . The rump was full of flavour and melted in your mouth . An amazing dish and worth every last forkful. After such a glorious feast , I regret that there was no room for dessert but this will be rectify on my next visit. There are a lot of things to like about Ian Ussher 's food and his use of ingredients from Artisan suppliers is commendable . An extremely talented Chef and I look forward to more of his cuisine with anticipation . ©2012-2013;Robert Jacob;jacob'scrackers;jacobscrackers9; All rights reserved. Such a pleasure to eat such wonderfuly executed food . A remarkable young man and very talented . Will be following his progress with interest .